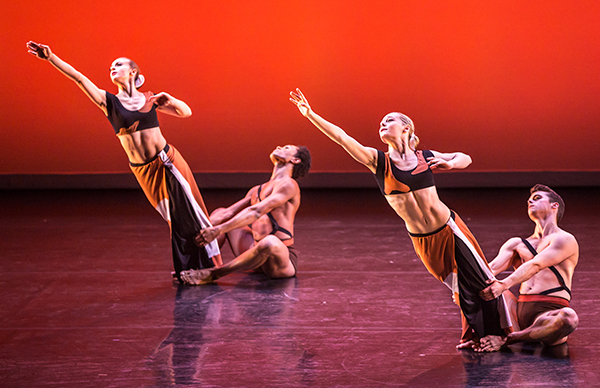 The Dark Meadow Suite is made up of highlights from a much longer work by Martha Graham, Dark Meadow, which premiered in 1946. The Suite, created in 2016, is designed to feature the exceptional choreography that Graham created for the ensemble of dancers in Dark Meadow. Both the unison dancing and the partnering have been recognized as some of Graham’s most architectural, ritualistic and profound creations. They are clearly inspired by Graham’s love of the rituals of the natives of the American Southwest and Mexico, which she observed as a young woman. The Mexican composer Carlos Chavez wrote the spacious musical score for Graham. The dancers often work in counterpoint to the score using the sound of their feet and other body percussion effects. In her original program note, Graham wrote, “Dark Meadow is a re-enactment of the mysteries which attend the eternal adventure of seeking.” It is an abstract work about life’s journey and the search for connection with one’s self and one’s community. This dance is a prime example of Graham as a leader in mid-20th Century modernism.